Your new hire is waiting in reception. He is perched on the chair, which is a little too low, trying to look relaxed. Slightly anxious, he is wondering if he will fit in. Is this going to be the job he hopes it will be? Right now, he is ready. Your opportunity to delight him will never be better. As his hiring manager, this is your time to shine. This is your opening night, and you need to go for the standing ovation at the end of the day. Just like an actor on centre stage, nothing else should matter today. Forget about your backache and the repair bill for your car. This guy in reception right now is your number one focus. Because if you get this right, you will have made a critical step towards gaining a loyal, productive employee. Your key objective for today – the first day of your new employee’s career with you – is to send him home feeling just as excited as he is right now. Give yourself time to clear those ‘can’t wait’ tasks for the day. 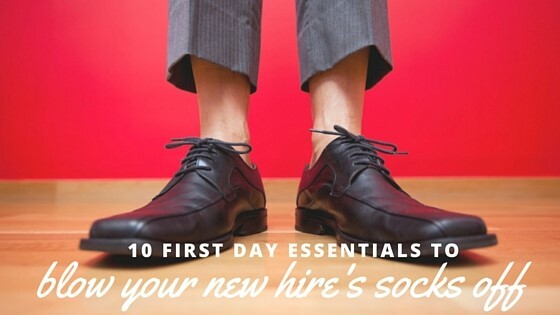 Arrange for your new hire to arrive an hour or so into the work day so you can give him your full attention. Nothing says ‘we don’t care’ more than a desk with a two-week old cup of coffee and photos of his predecessor’s kids still on it. Everyone loves a freebie, so leave some marketing goodies on his desk. Check his laptop and make sure that any other equipment he needs is ready to let him hit the ground running. You don’t want him to feel like the new kid at school being introduced to an unsuspecting class. Remind your team of his name, his background and his role so they can welcome him properly when he arrives. You may even want to circulate his resume. He wants time with you. In his eyes, you are the star of the show, so start making that connection with him today. Once the office tour and initial introductions are done, it is time for you to set the scene. The first thing you should cover is a review of his job responsibilities. These would have been discussed during the interview stage, but his mindset was completely different then. He wasn’t thinking about doing the job, he was thinking about getting it. You would be amazed how many people I have spoken to – from Senior Directors to Graduate Trainees – who confessed that they didn’t really understand what their job involved until sometime after they started. And let’s be honest, most job descriptions are full of horrific corporate blurb and sentences that say nothing. So don’t rely on those. Start his day with a run through of what his job entails. He can then use this as a point of reference for everything he learns over the next few weeks. Next, talk him through how you are going to get him ready for his new job. What will his onboarding schedule involve? What are the objectives? What do you want him to be able to do by the end of it? Outline what you think success for him in one/three/six months will look like. Try and make this picture of success as measurable as possible so that you can both track his progress. Then, talk him through how this glorious organisation he has just joined fits together. Organisation charts are good here along with a discussion about how all the different departments work together. What is the preferred method of communication for the company – email/ skype/phone? Which individuals would be a good support network for him from other departments? Are there any raging office politics which he may unwittingly get caught in the crossfire? Do be cautious of sharing personal grievances you may have with people. Fresh eyes may help with that situation. Besides, this is day one. Be honest but don’t drag him down into the weeds. Introduce him to the team over lunch. If the budget doesn’t stretch to taking them out, getting together in a meeting room with your own ‘bought from home’ lunch is good enough. The key here is a laptop/phone free hour of general chat to help bond your newly expanded team. But if you do all bring your own, let him know in advance so he doesn’t go hungry. Everybody needs a ‘go to’ person that won’t judge them. The person they can ask the stupid questions that they don’t want to bother their boss with. You know the type of thing – asking for the third time what the code for the photocopier is or the name of the lady in reception. This should be someone at the same level as your new hire. His ‘buddy’ should be formally introduced as his ‘go to’ guy or gal. Give some thought before you appoint a buddy for your new hire – consider who you think he may get on with, who sets a positive tone in the organisation, and who you hope he’ll emulate as he ramps up. The formalities have to be done. The more paperwork you can do before he arrives the better so his memories aren’t of a day full of paper pushing. What is the best thing he can do to get a good introduction to your organisation? The first step is to teach him as much as a new customer would know. This won’t happen in a day, but make a start. What is the purpose of your organisation? How do you earn money or achieve the goals you have as a business? Do you sell software? Sit him with one of the sales team to see a demo of the product and understand why a customer would buy it. Are you a charity? Perhaps your fundraising team can best outline the benefits your charity gives to your beneficiaries? Are you a retailer? What do you sell? What impression do you want to give to your customers? Who are your competitors? What matters to your customers? It has been a manic day for him. He has met a lot of people and learnt a lot of new stuff. A study by Harvard Business School tells us that by taking 15 minutes at the end of the day to reflect on all this can really boost his self-belief and his ability to absorb even more information tomorrow. So block out 15 minutes at the end of the day for him to write down the key things he has learnt. Catch up with him before he leaves for the day. On that point, even if you are a company that works 12-hour days, don’t expect this of him on his first day. Test the water. How does he feel after his first day? This is your time to fill in the gaps, smooth over any confusion and pump him up further for day two. Have a quick run through of the plan for the rest of the week and send him home with a busy brain and happy heart. And for you, it is time to take your bow on your opening night. Your reviews may not be made public, but be assured that they’re being discussed by your new team member. Do everything you can to guarantee that he’ll give you five stars.